WASHINGTON – December 21, 2004 – Recent studies have revealed that few of the nation's high school students are gaining the knowledge and skills they need to succeed in college and work. A new report finds an important explanation for this phenomenon: states do not expect their graduates to take courses that truly reflect the real-world demands of life after high school. In fact, according to the study released today by Achieve, Inc., in every state, students can take the courses necessary to meet graduation requirements yet still leave high school unprepared. 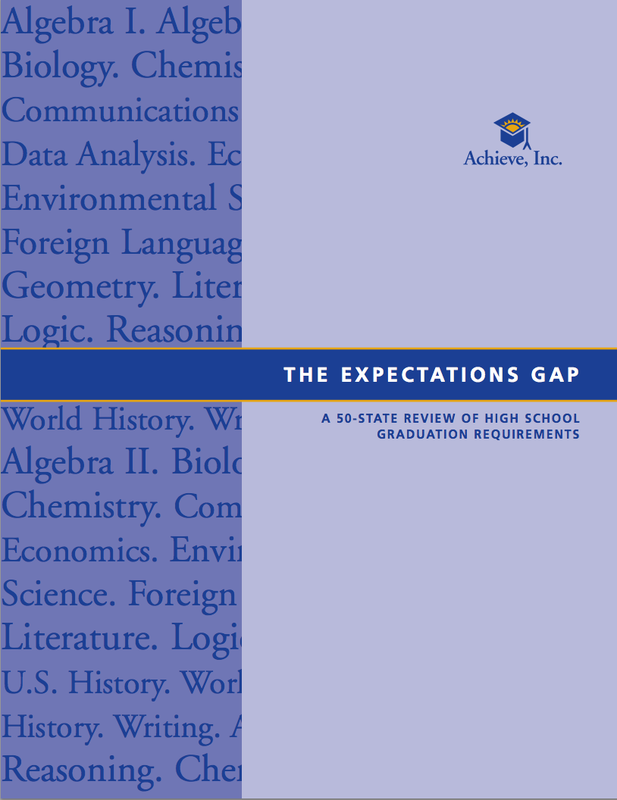 The study, The Expectations Gap – A 50-State Review of High School Graduation Requirements, indicates that in order to be fully prepared for work and postsecondary education, each student should take a minimum of four years of rigorous mathematics and four years of grade-level English. Math courses should include Algebra I, Geometry and Algebra II, as well as data analysis and statistics, and English courses should include literature, writing, reasoning, logic and communications skills. But the study reveals that no state currently requires every high school student to take a college- and work-preparatory curriculum to earn a diploma. Only three states – Arkansas, Indiana, and Texas – have made or will make a college/work-prep curriculum the norm, and while all states offer students the option to pursue a truly rigorous course of study, a less-rigorous set of course requirements remains the default curriculum in almost every state. "Expectations for students go hand-in-hand with results," says Michael Cohen, president of Achieve. "Rigorous preparation is essential for students to be well prepared for success after high school, and the efforts of several states to raise graduation requirements, including Arkansas, Indiana, and Texas offer a model for other states to follow." Currently, just five states – Alabama, Arkansas, Mississippi, South Carolina, and West Virginia – require all students to complete four math courses for graduation. Twenty-four states and the District of Columbia require three years, while 13 states require only two. Overall, nearly half the states (22) do not specify which math courses students need to take, making it difficult to ensure a common core of learning. Of those that do specify, only Arkansas, Indiana and Texas now or soon will require Algebra I, Geometry and Algebra II. Meanwhile, although 36 states and the District of Columbia require all students to take at least four English courses to graduate, just six states – Alabama, Arkansas, Kentucky, North Carolina, Texas and West Virginia – specify four years ofgrade-level English. Regardless, because English course descriptions across the states are confusing and ill-defined, it is very difficult to determine the rigor of the courses high school students are expected to take. "Some worry that raising graduation requirements will hurt students, but nothing is more harmful than sending young people out into the real world unprepared," says Matthew Gandal, executive vice president of Achieve and senior editor of the study. "As states gradually raise expectations and provide students the support they need to meet them, they give their young people a chance for a much brighter future." Earlier this year, the American Diploma Project (ADP) – created by Achieve, The Education Trust, and the Thomas B. Fordham Foundation – established benchmarks for the knowledge and skills required for students to succeed in credit-bearing courses in college and in careers that provide a living wage. The report noted that, as a result of poor student preparation in high school, states and employers must spend millions of dollars on remedial courses that cover what students should already have learned in high school. Currently, as many as 28 percent of college freshmen are immediately placed into remedial courses. Even with the extra help, roughly half of all college students do not graduate. The inadequacy of high school preparation is also underscored by Public Agenda surveys in which employers and college faculty say that high school graduates lack even basic skills in reading, writing and math. A similar survey from Rutgers University revealed that most workers acknowledge that they were poorly prepared by their high schools; in fact, a majority gave their school a C, D or failing grade. Align academic standards in high school with the knowledge and skills required for college and workplace success. States must work with postsecondary officials and employers to define the knowledge and skills necessary for graduates to successfully perform in college and the workplace without the need for remediation. Require all students to take a common college- and work-preparatory curriculum in math and English. Currently only Arkansas, Indiana, and Texas set an expectation that all students will take a rigorous college- and work-preparatory curriculum, requiring students (and their parents) to "opt out" of such a curriculum rather than "opt in." Pay attention to content, not just course titles. State standards must clearly define the core content of required courses to ensure that educators have a common understanding of what is essential for students to learn while providing flexibility for how schools deliver that content. Encourage students to go beyond the core. States should encourage all students – particularly low-performers – to pursue accelerated options for earning postsecondary credit in high school. Monitor results. States must track student achievement from K-12 through postsecondary and use data to help improve the rigor of course offerings and instruction in high school. To help address the urgent need to identify the policies and practices necessary to ensure that all students graduate ready for the demands of postsecondary learning, work, and citizenship, Achieve and the National Governors' Association will host the National Education Summit on High Schools in Washington, D.C. February 26-27, bringing together all 55 of the nation's governors (from states and territories) along with top business executives and prominent K–12 and higher education leaders. For more information on Achieve, Inc. and its work, please visit www.achieve.org.